Christian Cultural Center’s Performing Arts Department is already at home in the Church’s very own state of the art theater/concert venue. It has hosted numerous gospel artists, such as Kirk Franklin, Fred Hammond, Israel Houghton, Yolanda Adams, Jonathan Butler, Martha Munizzi, Dino Kartsonakis, Charles Billingsley, Mary Mary, Richard Smallwood and BeBe & CeCe Winans. We have also musically accompanied mainstream entertainers the likes of Stevie Wonder, Patti LaBelle, Michael McDonald, Kirk Whalum and have been accompanied by the Manhattan Pops Orchestra. Our dramatic musical presentations have graced the stages of legendary concert halls such as Carnegie Hall, Lincoln Center, Nassau Coliseum, and dynamic show places like Radio City Music Hall and The Theater at Madison Square Garden. Whether performing at functions for the Mayor of the City of New York, the New York Police Department, or the students of the New York Department of Education, we have found our voice and we are using every opportunity to represent Christ in Culture. 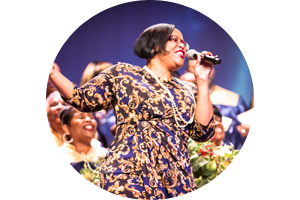 From Old Hymns of the Faith, Down Home Gospel, Contemporary Christian Music, Classical, Jazz, Christian Rap, Spoken Word, CCC's Performing Arts Department delivers passion, polish and style. Below is a brief description of each department for your enjoyment. The Dance Division’s thrust is interpretive dance. Utilizing the expressive dance forms of modern, jazz, mime, and the movement of worship; a unique blend of contemporary gospel dancing is created. The Drama Division is a multi-talented staff of adults and children that are equipped to perform on several production levels, ranging from a short skit to a full scale Broadway musical production. You’ll be sure to experience the Broadway show atmosphere of professionalism, creativity, and energy. Audiences are compelled to laugh, cry and experience the full range of human emotions. The CCC Singers are able to create a musical environment that touches the heart and soul of their listeners. This unique ability, draws men and women out of their present concerns into an atmosphere of peace, love and joy. The vocal and musical selections vary in style from Traditional to Contemporary Gospel while occasionally incorporating the idiom of Jazz. Rappers are also incorporated to speak the language of today’s youth in a clear and positive voice. This group is extremely versatile, whether performing as a choir, ensemble, trios or as harmonic duets, you can be sure you will experience a musical presentation of excellence. The music team is actually made up of several small bands that were individually created to meet the heavy demands of Christian Cultural Center’s Creative Arts Department. The orchestration is comprised of a rhythm section, reeds, brass and percussion, standard in many music ministries today…but there is a unique blend of jazz, hip-hop and rap exposure in our praise when the choir gets to praisin’ the Lord! The heart of the music team shines forth in their efforts to praise the Lord with their instruments and a lot of time is put into assuring the praise team lets the Holy Spirit lead our worship time. Our love for God is demonstrated by our obedience.